A new lifelike seagull ‘bot is one of the most realistic bio-inspired flight machines I’ve seen. SmartBird takes off, flies and lands on its own, flapping its wings and turning its head and tail to steer. It is modeled on the herring gull and its appearance and movements are uncannily similar to the real thing. 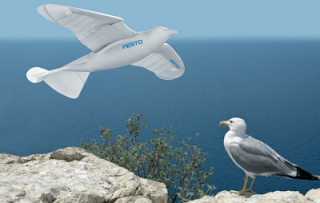 Designed by the German firm Festo, which also brought us the elephant-trunk-inspired robotic arm and the autonomous robotic jellyfish, SmartBird is Festo’s newest entry in its Bionic Learning Network program, which involves several universities in the U.S. and Europe and aims to use nature as a model for mechatronic systems. The bird has a 6.5-foot wingspan, so it’s much larger than a real gull, but it looks pretty much like the real thing, as you can see in the video below. SmartBird flies like a seagull thanks to an active torsion system combined with a complex control system. Its wings each consist of a two-part arm wing spar with an axle bearing on the torso. The wings and tail are the only mechanisms creating lift, and Festo engineers had to figure out bird flight in order to do it.